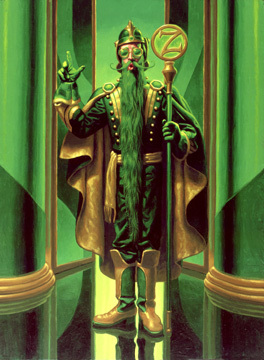 The Soldier with the Green Whiskers–the head guard in the Royal Army of Oz. In the original novel, 'The Wonderful Wizard of Oz,' this character is the one who tells Dorothy about Glinda, the Witch of the South. He is also the soldier who escorts a member of Dorothy's group to see the Wizard of Oz each morning upon their first visit. In later Oz books he appears as a private in the Royal Army of Oz and the personal Body Guard of Princess Ozma, and eventually, he is said to be the last remaining soldier in the Army of Oz. IMAGE AREA: 16" x 21.5"